I’ve been surprised to learn how many companies today are still using SEO/SEM as a primary acquisition tactic, in fields as varied as local services like HVAC repair and plumbing to party supply rental and finding a medical specialist. This surprised me because of three trends I have been following. – As our collective internet time moved further and further to mobile, there was once a question as to whether mobile web would be an effective channel to access applications and services, or if native apps would dominate. Today, the verdict seems clear that app usage is by far the dominant driver. We primarily use native apps, not the mobile browser. 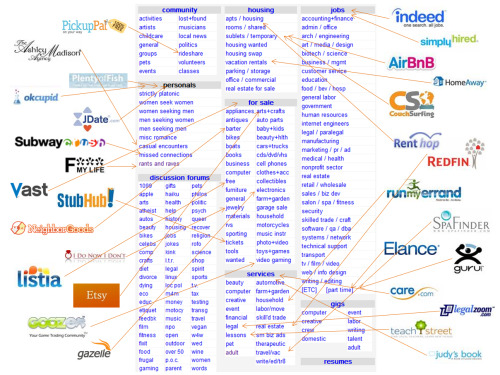 – Verticalized/single-purpose applications launched over the last half decade focused on apartment search, on-demand transportation, food delivery, telemedicine, and so on seem to have proliferated, in every category that you might once have found on Craigslist (h/t Parker’s original graphic) suggesting that instead of having to go to an all-purpose “find me X” experience, there ought to be a vertical platform that does that. – As social overtook search as the primary traffic driver of the web (for example, Facebook has now passed Google as the biggest referrer of traffic for digital publishers), thus would very quickly follow applications which would monetize using social as the traffic driver. – Google search has been overtaken in traffic, but is of course still enormous. – Lower-frequency activities (I need a plumber. I need a podiatrist) are very hard to build single-platform experiences for without using SEO/SEM, because intent capture aka “I need X” is the very best moment to acquire a new user, not when you see your Facebook friend post about it, or when you get invited by your friend. – Since SEO/SEM is largely based on relevant links, building a supply of organic inbound links at scale is no different than building any other marketplace, where you create a network effect as more long-tail providers get their leads by being linked to you, thereby your search results improve, and so on and so forth. What might replace Google-dominated SEO/SEM? The ‘concierge’ services that have launched recently – Magic, Operator, Alfred, etc. – have a great opportunity to aggregate demand in a new mobile experience that takes some of the juice away from Google, but they are fighting against a few things that make their road less obvious. The cold start problem: “OK great, I can get anything done. But I don’t really need anything. Annnnd I forget about the app.” Google search habit, and indeed single-purpose applications in the given verticals. But nonetheless, they do show promise at massive scale if they can overcome these challenges. There are other applications, either created by messaging apps like WeChat, LINE and business communications apps like Slack, or running as third-party applications on top of them, who have daily eyeballs at massive scale, and are starting to experiment with “intent generation” over a few of the use cases that might otherwise have been more appropriate for Google. But nonetheless, I am still excited about SEO/SEM driven lead generation marketplaces. I think those strategies still have much life in them yet. Next PostWait, Does the “Influencer Strategy” Ever Work?